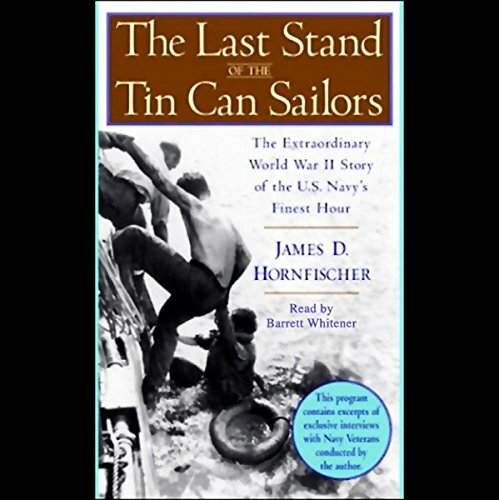 In Tin Cans and Greyhounds, author Clint Johnson brings listeners inside the quarter-inch hulls of destroyers to meet the men who manned the ships' five-inch guns and fought America's wars from inside a "tin can" - risking death by cannon shell, shrapnel, bomb, fire, drowning, exposure, and sharks. Told from the point of view of the men who waged this steel-shattering battle, The Last Stand of the Tin Can Sailors captures Navy pilots attacking enemy battleships with makeshift weapons and sacrificial valor, a veteran commander improvising tactics never taught in Annapolis, and young crews from across America rising to an impossible challenge. It takes us into the heart and mind of an iron-willed, self-made executive officer leading his men throughout a sea of carnage and two hellish days and nights clinging to survival amid oil, blood, sharks, and madness. 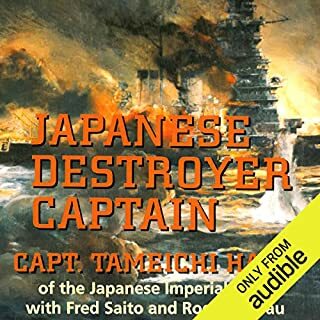 And it dramatizes how the overmatched U.S. force, enduring the loss of five gallant ships and nearly a thousand brave men, turned a certain crashing defeat into a momentous victory that would lead to the final surrender of America's ruthless imperial foe. 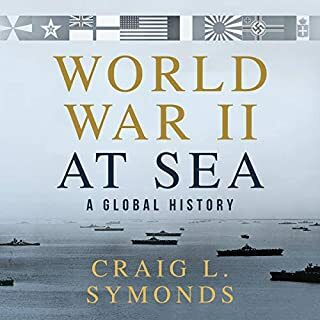 Filled with riveting detail and based on the author's extensive interviews and correspondence with veterans, unpublished eyewitness accounts, declassified documents, and rare Japanese sources, this is war at sea as it has seldom been presented before. It is an unforgettable narrative that captures the essence of heroism, the power of loyalty, and the way in which the unadorned truth is more stirring than legend itself. 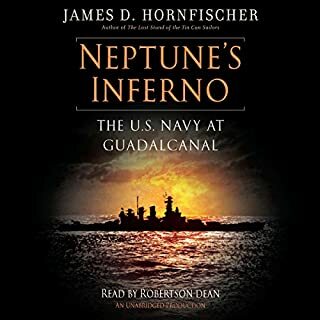 Also, this audio program contains excerpts of exclusive interviews with Navy veterans conducted by the author. ©2004 James Hornfischer (P)2004 Books on Tape, Inc. The author dug deep and put together an amazing true story, one that any person interested in World War II history should read. I agree that, sometimes, there was too much detail; but, one gets an amazing impression of battle, heroism and, most importantly, the stupidity of war. I wish the author had written with stricter chronology in mind. On multiple occasions, the same ship sunk several times. It would have been better if each ship that sunk were described as sinking only once, with all related details chronologically related at all once. In all, however, this is an unforgettable book. It was worth the sometimes-struggle to get through it. This is an EXCITING story! I was only casually familiar with this fierce battle before I read the book. Now I am sorry that I did not learn the full story sooner. The author has gathered an extensive library of facts and eyewitness accounts of the incredible bravery of our sailors. The biographical sketches at the beginning of the story seem a little long, but do offer good insight into the character of these valiant men. Then, when the battle is joined, I could not stop listening until the end. One can only stand in awe of their bravery. An Excellent true story depicting the David versus Goliath naval battle in 1944 Philipines. 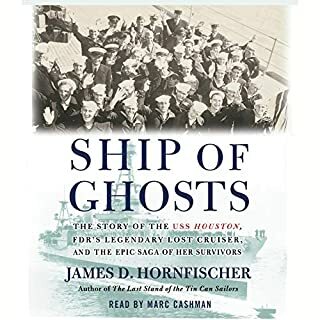 Author James Hornfischer provides outstanding insight into the lives of our heroic sailors. He provides deep background information as to how Admiral Halsey got caught between a rock and a hard place. Most readers will broaden their WWII knowledge after reading/listening to this book. Though the beginning of this book left me dizzy with the nonstop barrage of facts, it evened out into a fantastic, truly unbelievable story. Highly recommended. 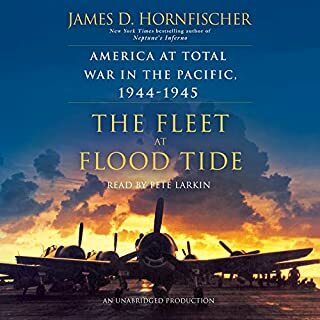 While the author sometimes gets hung up with details that lend little to the heart of this book, the story itself leaves the listener in awe of the bravery shown by the sailors of the United States Navy's Task Force Taffy in the 1944 Battle of the Samar. This is non-fiction history that is as exciting as any adventure novel. This book is an unusual blend of nail-biting excitement and well-developed characters that seem normal like your friend or next-door neighbor. Most of the heros here are rather typical sailors until they find it within themselves to rise to a level of bravery that few of them could have probably believed themselves capable. Other reviewers have complained about the detail into the participants' backgrounds. I, on the other hand, feel that these sketches make the characters seem real and that the sailors almost become friends. The reader does an excellent job. He is always easy to listen to and has a natural voice for this type story. What did you love best about The Last Stand of the Tin Can Sailors? The story and detail was so vivid I felt like a lost my comrades. What was one of the most memorable moments of The Last Stand of the Tin Can Sailors? The Navy battlefield is a ghost after the battle; it disappears under the sea. MUCH much better than the book on the Bismark. That one was so bad I got my money back. This one is GREAT. Excellent book slightly let down by the reader. A real sailors eye view of the action off Samar. 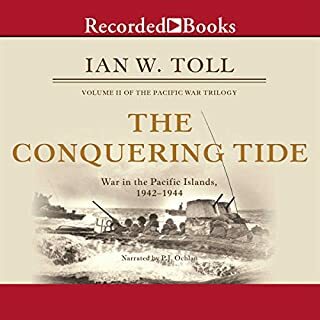 If you're interested in the war in the Pacific you should definitely buy this book. The only fly in the ointment for me was the voice of the reader, sounded very flat, almost robotic in his intonation.